THE STORY: Eve Minary has suffered a nervous breakdown and been in a catatonic state for seven years ever since the death of her father Judge Ladbrooke. Through the miracle of a new intravenous drug treatment she is about to awaken from her Darkness of Slumber (1944). Her doctors are hopeful that as she regains her power of speech and memory they will be able to discover what sent her into a catatonia. While Eve is recovering Dr. Ian McKeith and his protégé Dr. Marc Castleman conduct several interviews with family and friends. These conversations reveal details of the past and the two psychiatrists begin to suspect that a long forgotten murder -- of an assistant who worked for Eve's lawyer husband Phillip -- might be tangled up in Eve's strange psychological malady. But when the final treatment of the drug is administered Eve suddenly dies. Castleman orders an autopsy so that he can be sure the drug was not the cause and he discovers that Eve had been poisoned with nicotine. Castleman begins his own investigation certain that the two murders are interconnected and that Eve was silenced for what she knew. THE CHARACTERS: The two psychiatrists serve as amateur sleuths in the early part of the novel. When Castleman, the younger of the two physicians, grows tired of the sloppy police work and suspects that the head police detective may have personal interests in a cover-up connected to a political graft scandal he decides to take matters into his own hands. McKeith warns Castleman that his questions may uncover more problems and lead to further trauma for everyone involved. Castleman takes the lecture at face value, is relatively unmoved by his mentor's dire warnings, and is determined to pursue the truth. There is a relatively large cast of characters centering on the Minary and Ladbrooke families. Everyone in the cast gets their moment to shine as Castleman conducts his interviews and subtle probing of the events that led to the murder of Hal Crane, a legal assistant who worked for Phil Minary. 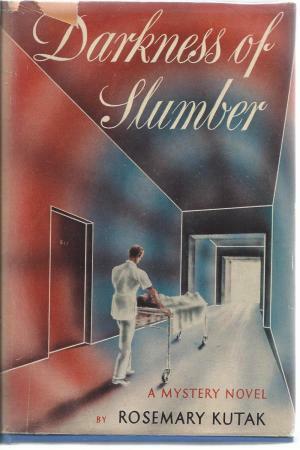 But though we get to know Scott Ladbrooke, Eve's devoted brother; Barbara Minary, Phil's second wife; Jeff Halsey, Phil's law partner; and a couple of odd mental patients at Oaklawn Hospital the real standouts among the suspects are the two women -- Cissie Humber, Eve's best friend, and Madeleine Ladbrooke, Scott's wife. Kutak has a lot to say about these two women and women of the post-war years in general. There are three sections for the book, each told from a different point of view. Barbara is the first narrator, Dr. McKeith is the second and Castleman who tells more than three quarters of the story is the last narrator. Kutak exploits her two male points of view in order to comment on the emergence of a new ideal of woman that she clearly finds horrifying. Madeleine is the embodiment of "the complete negation of femininity." Kutak sums her up with a savage description when McKeith is reminded of a platinum mannequin he once saw in a department store window, a faceless cold metal figurine: "The worst feature of the grotesque figurine was its intention. For it was not a caricature, but an interpretation of feminine sophistication. Only a woman as streamlined and metallic as the mannequin could properly wear the clothes it displayed." In contrast there is Cissie who unlike Madeleine is not a beauty hiding herself in clothes and artful make-up but rather she is a brash and loud celebration of everything women like Madeleine are trying to restrain and squash. Cissie with her frank humor and self-deprecating style has the best lines in the book, she has the most humanity, the most common sense. She is one of the few characters who sees events and people for what they. When prompted to give up her one secret she does so easily and with great relief much to her surprise. So grateful is Cissie to Dr. Castleman for his gentle compassionate manner she practically begs to become his next client for psychoanalysis. Castleman sees it as a flippant remark, but is nonetheless equally thankful for Cissie's revelation of a damaging incident in her past that proves crucial to understanding why Eve had her nervous breakdown. INNOVATIONS: One of the most unusual detective stories of the 1940s Darkness of Slumber is a prototype of the now popular forensic psychology crime drama. As both a detective story in its traditional sense and also one of memory and behavior Rosemary Kutak handles her original idea with sophistication and insight. The novel relies heavily on recall of the past and conver-sations make up most of the action, but it is not without moments of true suspense and dangerous incidents. Kutak's penchant for literary metaphors make for some startling images. However, her conceit of using the analogy of an animal hunt for the murderer's search gets heavy-handed when she refers to the still unnamed killer as "the tiger" for an entire chapter. There is a notable emphasis on describing women's clothing, especially the prominence of brown shades. Barbara shows up in a brown outfit and her arrival into a room is likened to the rush of autumn leaves sweeping down a sidewalk. Madeleine wears nothing but beige and taupe and tan. She is described as being "overbred" and "enervated." In one arresting paragraph Castleman sees Madeleine as only coming to life when the talk turns to death calling her a modern ghoul and a vampire. THINGS I LEARNED: When Marc Castleman looks up the symptoms and reactions of nicotine poisoning he consults Pearson. I figured this must be the author of a book on toxicology. And I was right. Arthur Pearson Luff (1855-1938) was a physician and chemist and is considered the founder of forensic chemistry. His manual Textbook on Forensic Medicine and Toxicology was published in 1855 and went though numerous editions well into the 1930s. It is apparently a bible for anyone in medical jurisprudence and physicians who want to know anything about poisons. And based on the reference in this novel Pearson's book must have still been in use in 1944. QUOTES: There passed through her mind, memory of a superstition of early mankind, about the mandrake. The plant that shrieked when uprooted, and brought death and a calamity to any mortal who dared disturb nature's secret plant. Those screams of Eve's...that must be how the mandrake root sounded when torn from the enveloping soil. A protest from nature itself! Abruptly Madeleine's careful lacquer of poise cracked up, and suppressed emotion flooded to the surface. The horror in her eyes, the profound inner shudder, revealed the force of haunting memory. [...] But abruptly as it had lifted Madeleine's noncommittal mask came down over her face again. Disappointingly the lid of Pandora's box had banged shut and McKeith wondered in sharp dismay how he was going to pry it open again. Cissie: "Do you see what I see over there? Slacks in this restaurant! I guess there is a war going on but I didn't think it made people so desperate. That woman's rump looks like a trailer bumping along behind a four door sedan." Cissie: "Hal said I didn't look like I belonged to this century. That I had a medieval look -- a look of 'timeless endurance and ancient tenacity.' Something Rembrandt painted into his pictures of peasants and mystics. I think Hal meant it for a compliment, but as I recall peasants and mystics are not conspicuous for their feminine charm. And the old Dutchman always painted such stolid looking women. I can't say that I'm very thrilled at being taken for a Rembrandt." McKeith: "It seems that your husband and I both have closed minds"
Madeleine: "Isn't that to be expected? After all, you're both men." THE AUTHOR: I can find very little about Rosemary Kutak other than she was born in 1905 and died in 1999 in Louisville, Kentucky. Her real first name is Margaret and her maiden name is...Norris! (No relation at all, I assure you.) She wrote only two mystery novels. 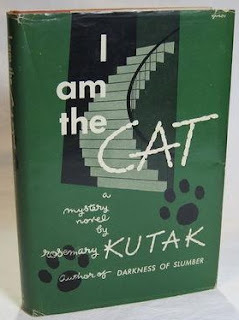 Her second novel I Am the Cat (1948) also features Dr. Marc Castleman as detective and is modeled on the old country house mystery novel formula. I'll be reviewing that book later this year. RECEPTION: Darkness of Slumber was one of the most widely popular mystery novels published in 1944. The original hardcover from Lippincott went into three printings over a course of six months and was still selling in the spring of 1945. The Pocket Book paperback published two years after the hardcover had two printings. The book was also named one of the "Ten Best" novels by The New York Times Book Review. Isaac Sanderson in his December 3, 1944 New York Times book review called Kutak's novel "extraordinary." 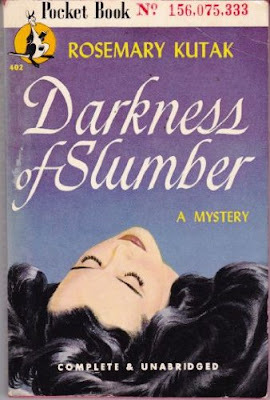 The Edgar Awards had yet to be invented in 1944, but I'm sure if they had existed Darkness of Slumber would have been a leading contender for Best First Mystery. You interest my strangely with this - emphasis on woman's clothes, hmmm? I may have to investigate. Ha ha! But of course. I think you'd appreciate this book, not just for the clothes talk. It's hard not to pay attention to all the wardrobe descriptions. When they come they are specific choices that tie into her themes and I was impressed by that. Kutak presents her ideas thoughtfully and often provocatively. I was impressed with the intelligence and complexity of this story and the very human, troubled characters. It has a contemporary feel to it even with if the psychology relies a bit too much on Freud. Wow, this looks like a real gem. Thanks for bringing it back from obscurity for dilettantes like me. For once a book lives up to its legendary hype. This is most definitely one of the best American mysteries of 1944 and probably the entire decade. I only hope I Am the Cat is just as astute, penetrating and gripping. Another very interesting choice. I'm keen to read this one. I think you would very much enjoy this one, Martin. I recently read my first Anne Cleeves novel (who is your close friend and whose books you talk about a lot) and discovered she has a lot in common with Kutak.